Onn Fleek provide no information on their website about who owns or runs the business. The Onn Fleek website domain (“onnfleek.com”) was privately registered on October 4th, 2017. Onn Fleek represent they are being operated from Argentina, however the corporate address provided is shared office space belonging to WeWork. There is no evidence suggesting Onn Fleek has a physical presence or actual business operations in Argentina. That said it is highly likely that Onn Fleek is being operated out of South America. Offered languages on the Onn Fleek website include English, Portuguese (Brazil) and Spanish. 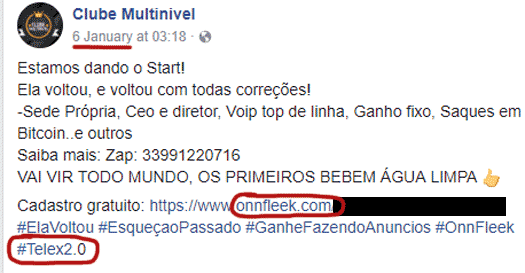 Most of the available marketing for Onn Fleek is in Portuguese and targets Brazil. Onn Fleek market a VOIP app they call Slay. For $149.70 a year, Slay subscribers are able to make 400 minutes worth of calls each month. At the end of 26 weeks an Onn Fleek affiliate must reinvest in order to continue earning. Onn Fleek affiliates are paid $20 per affiliate they recruit. Onn Fleek pay residual commissions via a binary compensation structure. Onn Fleek cap residual binary commissions at nineteen levels. Onn Fleek pay a $20 residual commission per newly invested Store or Mega Store position matched on both sides of the binary team (1:1 ratio). 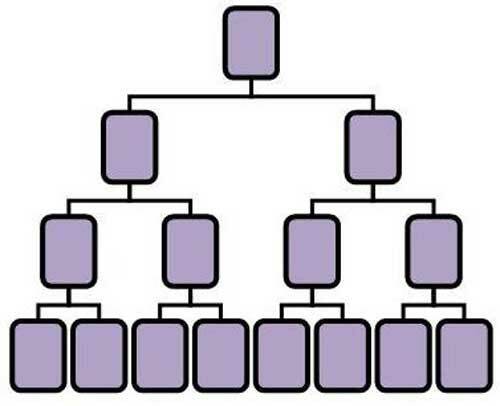 Onn Fleek affiliates who invest in a Mega Store position receive $60 per new Mega Store position matched on both sides of their binary team (1:1 ratio). Onn Fleek pay residual store commissions via a unilevel compensation structure. Onn Fleek affiliate membership is $50 plus either a $299 or $1397 investment position. Investment positions expire after 26 weeks, after which they must be renewed in order to continue earning a weekly ROI. (2) a slang term used by uncultured idiots to describe perfection. Onn Fleek appears to be an attempt to remarket the TelexFree Ponzi model to a new generation of millennials. TelexFree was a $3 billion dollar Ponzi scheme that promised either a $20 per $299 “AdCentral” position invested in. If a TelexFree affiliate invested in an “AdCentral Family” position for $1375, they received $100 a week. For reference, Onn Fleek are promising $40 or $200 a week on a $299 or $1397 investment for 26 weeks. Even at $149.70 a year (99TelexFree was $49.99 a month), Slay is still massively overpriced. For starters there’s a plethora of free VOIP options available. And if you need to call landlines through VOIP, Skype offers unlimited minutes for $13.99 a month ($167.88 annually). Using Brazil as an example, alternatively you can get 333 minutes a month for a $10 monthly fee ($120 annually). This does fluctuate depending on the country called though. Still, with pretty much everyone these days having some data allowance and VOIP using bugger all data, it begs the question who is spending hundreds of dollars annually on VOIP services? The answer is, as with TelexFree’s VOIP offering, next to nobody. Onn Fleek’s VOIP offering is smoke and mirrors to cover up Ponzi fraud. The company claims it will sell purchased VOIP plans to customers weekly for 26 weeks, based on what they call Automated Sales System on Demand (A.S.S.D). If such a system existed, why does On Fleek need affiliates to purchase VOIP subscriptions for resale in the first place? Surely they can just set up A.S.S.D to flog VOIP subscriptions and keep 100% of the profit themselves? And while I can’t say for certain whether TelexFree’s Brazilian fugitives Carlos Wanzeler and Carlos Costa are involved (the former of which is a fugitive wanted by US authorities), the near-identical TelexFree business model and targeting of Brazil is pretty suspicious. As revealed via the SEC’s investigation into TelexFree, all the anonymous owners of Onn Fleek are doing is using newly invested funds to pay off existing investors. A crap-ton of people across Brazil and South America fell for TelexFree prior to it being shut down in 2014. Here’s hoping those that were scammed don’t fall victim to the same lies and promises of riches again. Especially considering Onn Fleek’s use of bitcoin, which means victim fund recovery outside of the US would be next to impossible.